Indian Business Tycoon, Mukesh Ambani is an Indian business tycoon and the richest Indian in the world. The chairman of Reliance Industries Limited (RIL) is ranked among the richest people in the world and is considered to be one of the world’s most powerful personalities. 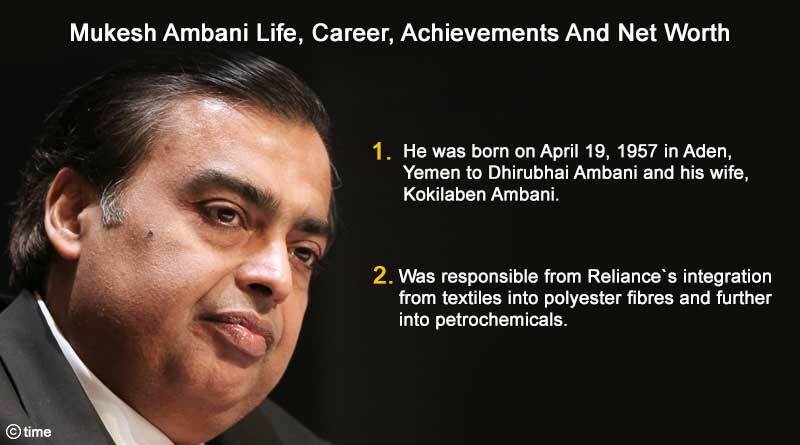 He has a net worth of US$ 54 billion and his group Reliance Industries is among India’s most valuable companies. He has been declared 8th Richest man in the world in Hurun Global Rich List 2019. He was born on April 19, 1957, in Aden, Yemen to Dhirubhai Ambani and his wife, Kokilaben Ambani. Studied at the Institute Of Chemical Technology, Matunga where he did BE in Chemical Engineering. Went onto attend Stanford University, USA, to earn a Masters in Business Administration (MBA). He opted out of it though to join his father’s business. Was responsible for Reliance`s integration from textiles into polyester fibres and further into petrochemicals. Created 51 new, world-class manufacturing facilities involving diverse technologies that grew a simple textile company into a whole industry. Reliance was founded by his father, Dhirubhai Ambani, a yarn trader, in 1966 as a small textile firm. After his father’s death in 2002, Ambani and his younger sibling, Anil divided up the family empire with Mukesh Ambani getting the oil and gas part of the business. His company currently operates in five major segments: exploration and production, refining and marketing, petrochemicals, retail, and telecommunications. Reliance industries in ranked among the second most valuable Indian company with Ambani being ranked as the richest Indian with a net worth of 54 billion dollars. His company is also a part of the Forbes500 list. Reliance Fresh has more than 700 stores throughout India. His company also bought a cricket team, Mumbai Indians in the IPL franchise for $111.9 million. His new venture Reliance Jio has been shaking up the market, attracting a flood of customers with offerings such as free voice calls and generous data packages.”Leading equity analysts have cheered the move and Ambani said the company is likely to break even faster than they earlier imagined. “ Jio has brought about a revolution in India’s telecom structure. His house, Antilia, is worth around $1 billion and is one of the most expensive properties in the world. It has 27 stories with almost all amenities available in the building itself. He is the owner of the Boeing Business Jet 2 and Falcon 900EX. Won the World Communication Award (2004), Business Leader of the Year (2010) and Asia Society Leadership Award. In 2010, he received the Honorary D.Sc. (Doctor of Science) degree from Maharaja Sayajirao University, Baroda. As per Forbes’ 2018 ‘World’s Billionaires’ list, Mukesh Ambani has been ranked 19th globally. He has been India’s richest Indian for the last 11 years. Recommended reading: Who is Shloka, the daughter-in-law of Mukesh Ambani?